The MP Series grinders give you an unbeatable choice for American-made quality, performance and enduring value. Our grinders are quiet, use less power, produce minimal dust, and reduce your manpower requirements for even more savings. Cutting anvil made from heavy-duty, abrasion-resistant AR-400 Steel. 5-1/2" to 7-1/2" diameter grinder shafts, warranted for five full years against breakage. 4-way reversible cutter teeth made from hardened D-2 tool steel provides the longest life of any comparable model. Designed to achieve optimum bite for the highest grinding yield. Rotor designed to spread load evenly over the entire cutting surface to increase efficiency and throughput while reducing wear and tear. 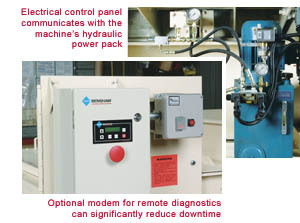 One of the most distinct advantages of the MP Series grinder is its "brains" - the ability of the electrical control panel to communicate and/or work in unison with the machine's hydraulic power pack. The result is optimal grinding performance every time. With too little force, full grinding capacity is never achieved. With excessive force, the rotor can jam. The MP Series control system continuously monitors current and signals the ram to retract when a predetermined amperage level is exceeded. In addition, the hydraulic power pack features a variable speed control which allows the ram cycle to be set at the appropriate speed for the type of material being processed, for example hard or soft wood, dry or green, pallets, stumps, etc. A pressure relief valve enables the ram to pause during the forward stroke when heavy grinding is sensed. When the pressure reduces the ram resumes its forward movement, eliminating nuisance cycling and maximizing efficiency. The control system also "thinks" about protecting your equipment. If tramp metal finds its way into the grinder, the unit will be instructed to shut down after three auto-reverses within a preset time frame. This virtually eliminates the potential for damage to the grinding rotor. We offers testing services with the MP Series at no extra charge. We provide free test grinding and videotaping of your material being ground. 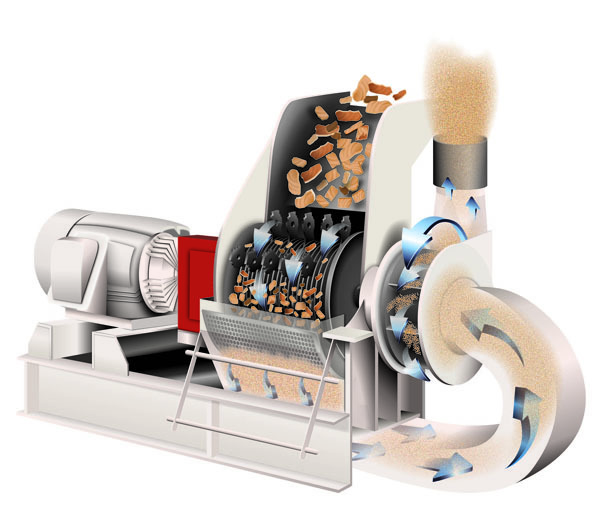 With over 5,000 wood grinding installations, our experienced engineering team has the expertise to determine the proper equipment for your specific application. With our exclusive Performance Guarantee you eliminate the risk of purchasing the wrong equipment for your needs. And if you have a unique application, you can provide us a sample for testing to determine the right model for your specific needs. We will then guarantee the equipment we build for you will perform as our test report indicates and will match the sample product returned to you for evaluation. Your equipment is guaranteed to produce the required product size at or above the desired throughput rate. MP-40 40-60 15" 3-7,500 lbs. 8,500 52" x 52"
MP-75 60-75 15" 5-16,000 lbs. 9,600 58" x 52"
MP-100 75-100 20" 7-20,000 lbs. 12,300 66" x 66"
MP-125 100-125 20" 8-25,000 lbs. 13,500 72" x 66"
*Capacity will vary depending on horsepower, screen size, and type of material being processed. Specific throughput capabilities will be provided following an analysis of each application. **Measurement taken at floor of grinding chamber. Hoppers available in various sizes to accommodate every requirement. 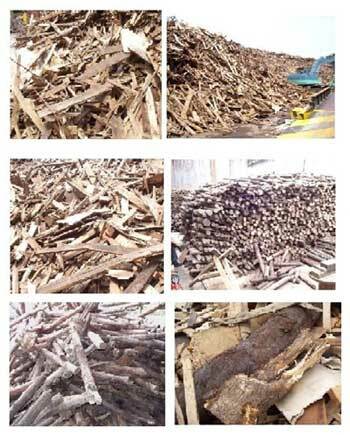 We offers a full range of products backed by expert service and support to meet all your wood processing needs. 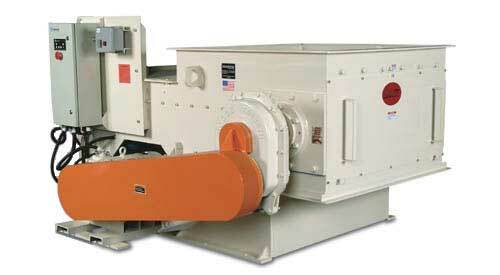 This includes our Industrial Hammermills that can be joined with the MP Series to meet your fine grinding needs. These finish where the MP Series leaves off, creating a uniform, first quality sawdust useable for compost, animal bedding, briquette manufacturing and more.